In 2013,Walgreens launched its new line called Ology and I think their products are a step in the right direction for those looking to Go Green! I've shopped at Walgreens numerous times and I did take notice of the very distinctive tan & pink packaging that made it stand out from all the rest. In my Review Kit, we received a Pack of Ology Paper towels, All-Purpose Cleaner spray, and Concentrated Laundry Liquid Detergent! The Paper Towels were the first products we tried. Ology Paper Towels are made from made from readily renewable sugar cane husk and quick-growing bamboo that regenerates in as little as six months.The Ology Paper Towels are 100% tree-free and are whitened with H2O2, a non-chlorine based bleach. We were NOT super fans. Although they are soft, absorbent, and Biodegradable... we found that they ripped too easily and I could never pull off an entire sheet! They are Two-ply and seem to pick up well, but we don't like ripped sheets. This 2-pack of Paper Towels Retail for $3.99! The All Purpose cleaner was the second product we tried. The Ology cleaner is free of harmful chemicals and does not contain any harsh solvents, dye, ammonia, or artificial fragrances. The ingredients are plant-based and effectively cut through grease and grime! We used it on a variety of surfaces in our home and it did indeed tackle the tough messes. At $3.99 a bottle, I do not mind making this my go-to product for cleaning. Try it for yourself, Only at Walgreens. 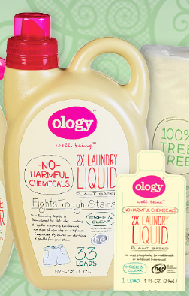 Ology 2x Laundry Liquid Detergent is available in a free and clear scent as well as a spring lavender vanilla scent, both of which are derived using only natural ingredients—nothing artificial. We received the Free & Clear scent for review and it smelled fairly good! The Spring Lavender Vanilla Scent would be more our style. I've used the detergent on my baby's clothes and it did remove some food stains. The 2x Laundry liquid works in both HE and regular machines! Aside from all of the Ology products containing NO harmful chemicals, every ology bottle is made from 100% post-consumer materials. The retail price for Ology Liquid detergent is $6.79! The Ology brand is endorsed by Healthy Child Healthy World, a national leading independent nonprofit organization, dedicated to the protection of children from harmful chemicals! Disclaimer: I received these products for free from the sponsor of the Moms Meet program, May Media Group LLC, who received it directly from the manufacturer. As a Moms Meets blogger, I agreed to use this product and post my opinion on my blog. My opinions do not necessarily reflect the opinions of May Media Group LLC or the manufacturer of the product.